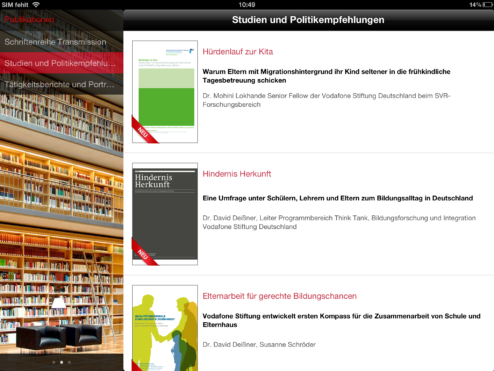 This app by Vodafone Stiftung Deutschland includes the think tank – works of the Stiftung, current studies and suggestions, as well as publications and expertise about education, integration and social mobility. 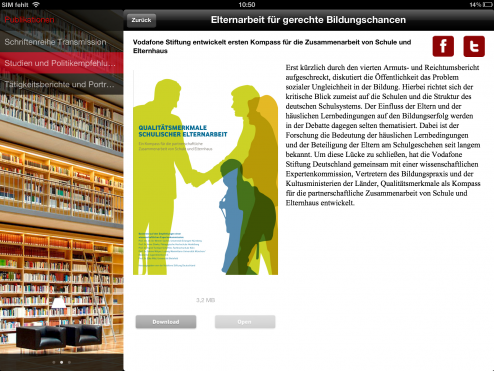 This app by Vodafone Stiftung Deutschland includes the think tank – works of the Stiftung. The app includes the literature, current studies and suggestions, as well as publications and expertise about education, integration and social mobility. The app is developed for decision-makers in politics, academics and media, as well as for everyone who is interested in these themes. In addition, the tablet app offers access to Vodafone’s YouTube channel and also offers a social media feature to recommend the app via Facebook and Twitter and share interests.